The IARC Monographs identify environmental factors that are carcinogenic hazards to humans. These include chemicals, complex mixtures, occupational exposures, physical agents, biological agents, and lifestyle factors. National health agencies can use this information as scientific support for their actions to prevent exposure to potential carcinogens. Interdisciplinary working groups of expert scientists review the published studies and assess the strength of the available evidence that an agent can cause cancer in humans. The principles, procedures, and scientific criteria that guide the evaluations are described in the Preamble to the IARC Monographs. Since 1971, more than 1000 agents have been evaluated, of which more than 400 have been identified as carcinogenic, probably carcinogenic, or possibly carcinogenic to humans. Read the IARC Monographs Q&A for answers to commonly asked questions on the evaluation process. 18 April 2019 A summary of the Advisory Group recommendations has now been published in The Lancet Oncology: article; PDF. 15 March 2019We are pleased to announce that IARC Scientific Publication No. 165: Tumour Site Concordance and Mechanisms of Carcinogenesis is now available online. 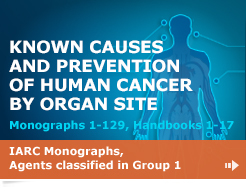 This volume reports on a two-part Workshop convened by IARC in 2012 and reviews the information on cancer sites and mechanistic events for all the agents classified in Group 1 in IARC Monographs up to and including Volume 109. 20 February 2019 We are pleased to announce that the Monograph on Some Chemicals That Cause Tumours of the Urinary Tract in Rodents is now available online. This volume includes seven monographs: 1-tert-butoxypropan-2-ol, β-myrcene, furfuryl alcohol, melamine, pyridine, tetrahydrofuran, and vinylidene chloride. 31 January 2019 We are pleased to announce that the Monograph on Pentachlorophenol and Some Related Compounds is now available online. This volume includes four monographs: pentachlorophenol, 2,4,6-trichlorophenol, 3,3′,4,4′-tetrachloroazobenzene, and aldrin and dieldrin. 17 January 2019 We are pleased to announce that the 2019 revised Preamble to the IARC Monographs is now available online. For details, please see Upcoming Meetings. 20 December 2018 We are pleased to announce that the Monograph on Benzene is now available online. 14 December 2018 The closing date for nominations of agents for consideration by the Advisory Group has been extended to 15 January 2019. For details, please see Upcoming Meetings. 2 November 2018 A summary of the evaluations has now been published in The Lancet Oncology: article; PDF. 7 August 2018 IARC is soliciting expert input via a scientific webinar, to be held between 15:00 and 18:00 (CEST) on 17 September 2018. For further details, see Call for Public Comments. 30 July 2018 We are pleased to announce that Volume 118 of the IARC Monographs is now available online. This volume includes three monographs: welding, molybdenum trioxide, and indium tin oxide. 29 June 2018 A summary of the evaluations has now been published in The Lancet Oncology: article; PDF. 13 June 2018 We are pleased to announce that Volume 116 of the IARC Monographs is now available online. This volume includes two monographs: drinking coffee, and drinking mate and very hot beverages. 25 June 2012 Volume 100 compiles information on tumour sites and mechanisms of carcinogenesis. About half of the agents classified in Group 1 were last reviewed more than 20 years ago, before mechanistic studies became prominent in evaluations of carcinogenicity. In addition, more recent epidemiological studies and animal cancer bioassays have demonstrated that many cancer hazards reported in earlier studies were later observed in other organs or through different exposure scenarios.